The Pixar Pitch was recently made popular in the world of business by Daniel Pink’s To Sell Is Human: The Surprising Truth About Moving Others. But it’s not just a powerful tool to pitch a movie or a sale. It’s also a powerful tool to change your own personal story. If you’ve seen any Pixar movie (probably any number of other movies), then you will find it holds true. Because of that, he was forced to deal with the strange new cars he met in the town. Until finally McQueen realized that friendships were more important than fame. Once upon a time there was a family in the suburbs that struggled with debt. Every day, they would stress about how to pay for what and out of that stress would decide to buy even more stuff on credit. Because of that, they got into an argument and spent a good bit of emotional energy blaming each other. Because of that, they decided that they had to get outside help and put a plan into place because not only were their finances worth it, but so was their emotional, spiritual, and physical health. Until finally, their hearts and minds had changed toward money and they were experiencing renewed freedom and joy on their climb out of their financial hole. The cool thing is that most of us haven’t hit the end of our stories. 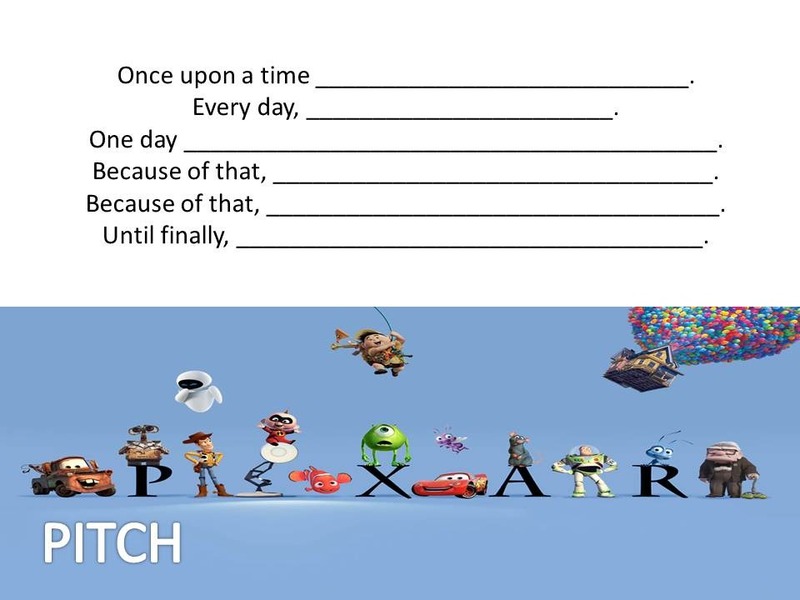 We can actually take this story structure and be proactive with our own personal stories (the Pixar PItch has it’s origins in playwright and improv actor Kenn Adam’s Story Spine structure, created as a tool for helping improv actors move a story forward). Where is your family’s story? Where’s your personal story? How can you create it instead of allowing it to just kind of… happen? Pick one area in your life where you’ve struggled with change. Your weight. Your money. Your spiritual life. Perhaps pick something simple and easy – one piece of the pie, like getting up earlier to start a new habit. Let’s say that you are only at the “Once upon a time” phase: Once upon a time, there was a man who struggled with his weight. Every day, he would eat dessert too late and grab snacks throughout the day when work would overwhelm him. That’s as far as you’ve gotten. You’re sitting at “Once upon a time” and “Every Day”. But you can start writing your story. You can decide on the ‘One Day‘ (or it will, no doubt, happen anyway). The ‘One Day’ is your decision point. It could be a heart attack, a type-2 diabetes diagnosis, or perhaps seeing yourself in a mirror and briefly not realizing that the fat guy was you. Because of that, you realized what you couldn’t continue the bad habits and had to lose weight. Because of that, you… joined a gym, Weight Watchers, went to the doctor…. Until finally… things changed and he was living a healthy physical life… (which led to renewed commitment to his faith, family, and work that was meaningful). Hardly anything wraps itself up in a neat little bow like that, but I believe it’s possible to choose to bust out of our ‘Every day’ routines – especially the ones that no longer work for us or those close to us. You can participate in helping to create your own story. I would say, though, that the story will be even better if it’s treated as two fish and five loaves of bread.